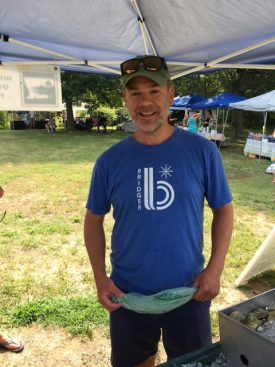 Friday, August 17, 2018 We, at the Charlestown Land Trust Farmers’ Market are INVESTED! We’re invested in maintaining natural resources and open space. We are invested in sustainable practices. We are invested in our community. How are we showing that investment? 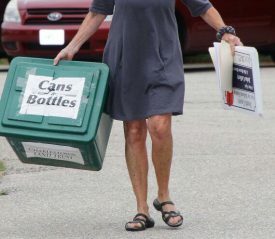 For one thing, this year we have a new policy to MINIMIZE THE USE OF PLASTIC – with an emphasis on single use plastic. Here are some examples of efforts to follow this policy. 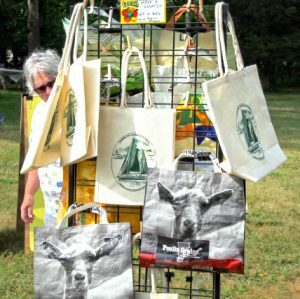 Every week at our CLT Market Table we offer reusable bags for Shoppers to purchase. Some of the bags are made of recycled materials by one of our volunteers. What does reduced use of plastic look like for Vendors? 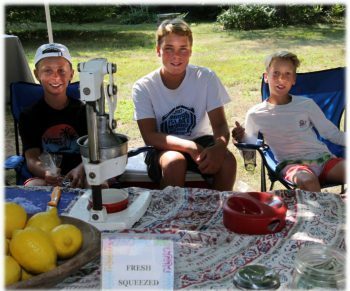 This year the Lemonade Boys have decided NOT to use plastic straws, an item that so often ends up on our beaches and in waterway, hurting animals that inhabit the area. 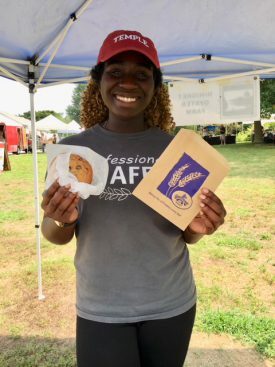 Great Harvest has paper bags for some of its products including for this delicious cookie held up by Blessing. 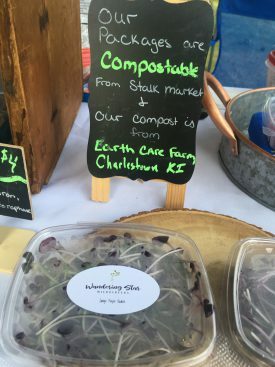 Wandering Star uses compostible containers and obtains compost from a local farm. 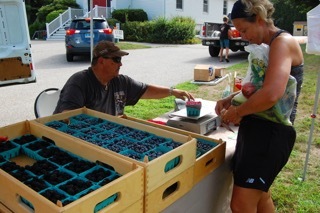 Narrow Lane Orchard uses cardboard boxes for their berries instead of plastic. 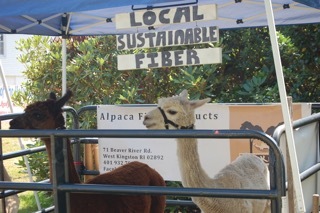 And Lazy K Ranch raises animals which provide the sustainable, renewable fiber for their beautifully soft items. 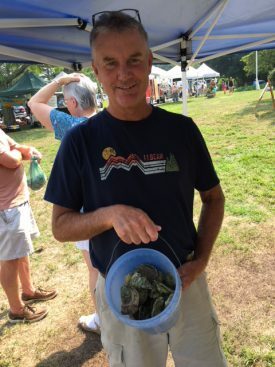 Our Shoppers are showing their investment in the care of the environment, not only by bringing their own reusable bags, but by using a bucket from home for carting off oysters…. ….and bringing a previously used bag for this week’s clams! Inspiring!!! So bring your own bags or buckets or whatever is needed in order to take home as much of your Farmers’ Market produce using as little single use plastic as possible! 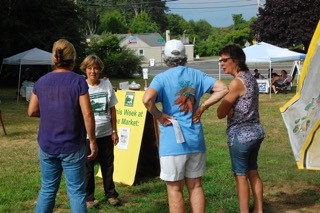 Another aspect of Sustainability has to do with keeping our market running week after week. Each Friday morning Vendors unload, set up, and arrange their goods. And each Friday afternoon they wrap up, pack up, and reload their vehicles. 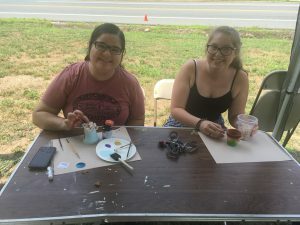 Our Volunteers – from Perspectives and from Chariho High School (along with our faithful CLT group!) have made a world of difference in the way the market works every week…We LOVE them! We were treated this week to a visit from Hera Gallery in Wakefield….What a treasure trove of potential artistic expression! Fairy Houses and crafts of all kinds were available for people of ALL ages! 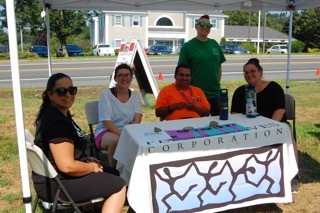 And once again, URI Master Gardeners showed up with all sorts of gardening info, soil testing options and welcoming smiles. 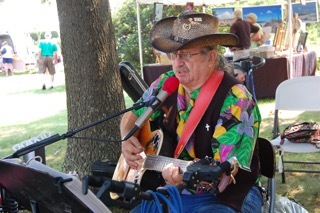 Glorybound came by this past week and gave us a country sound that fit right in with our market vibe. This coming Friday, August 24th, People’s Power and Light and the South County Art Association will be on hand. 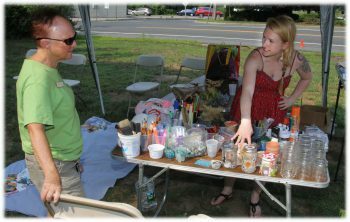 We’ll also be holding our annual PARTY MARKET! For Music we will be JAMMING – Bring your instrument(s) – clapping hands and tapping toes will do! Enjoy our CLT Party/Picnic with hot dogs on the grill and watermelon. Remember last year? We had a BALL…and WE PLAN ON JUST AS MUCH FUN THIS YEAR! Join us!